Billed as the concert of a lifetime, Desert Trip Indio saw 75,000 attendees descend upon the Empire Polo Fields — the site of Coachella and Stagecoach — for the first of three nights of what’s incomprehensibly mind-blowing classic rock lineup. By the time dusk hit, and the beer was flowing and the cocktails consumed, Bob Dylan (the only American on the bill) started the first night off with a blistering bang. Dylan, whose performances in recent years have been checkered at best, tore through a career-spanning set that featured a little bit of everything. Opening with “Rainy Day Women #12 & 35,” the bard had fans screaming “Everybody must get stoned” and from the jump, was in total command. Unlike his generally stripped down headlining shows, Dylan used the Desert Trip stage to project vintage black-and-white archival footage and some other seemingly political imagery, or maybe stuff that the singer/songwriter thought was cool. Either way, the randomness of what appeared on-screen confused audience members, who could be heard grumbling about what he was trying to do. As has been the norm with his sets, Dylan had nothing to say to the crowd. Instead, his 16-song set did most of the talking. Instead of potentially turning off attendees (read: boring) with songs from his two Frank Sinatra-inspired albums, the 75-year-old dug deep. Cuts like “Early Roman Kings” from 2012’s Tempest, the tour debut of “Lonesome Day Blues” and the dusted-off “Ballad of a Thin Man” demonstrated that Dylan can still weave curveballs into his sets. 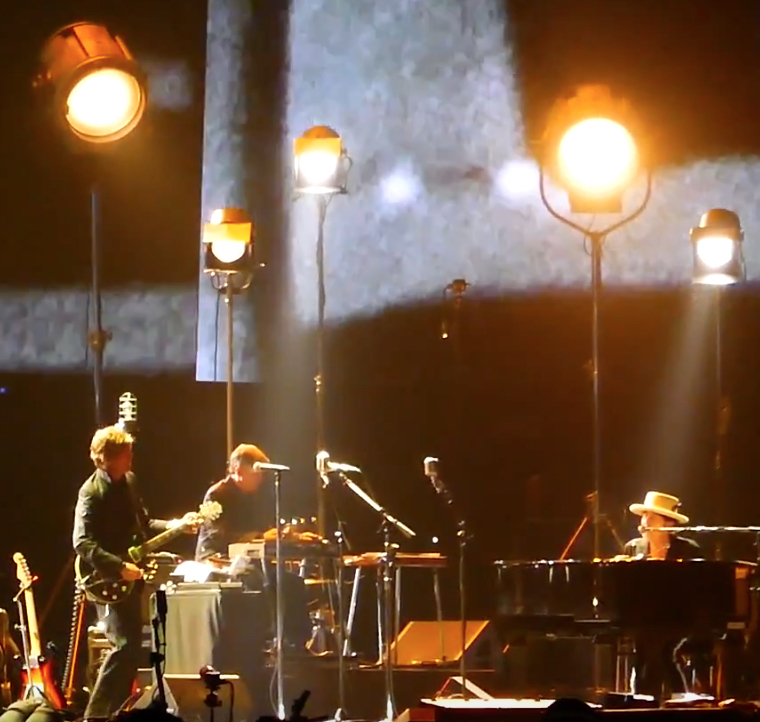 Otherwise, highlights included the slightly tweaked version of “Tangled Up in Blue” that featured alternate lyrics that Dylan junkies have on their Blood on the Tracks bootlegs, a whirlwind “Highway 61 Revisited” and a somber “Make You Feel My Love.” While the last song may be known for its covers by Billy Joel and Adele, Dylan’s version had a sincere twinge that continues to land it on his list of most unheralded songs. His one-song encore of “Masters of War” was the only time Dylan appeared to make any kind of political statement. The scathing ode to the military-industrial complex felt at home with the boomer lot, but said more to Dylan’s viewpoints potentially on what’s to come in the next month than many probably realize. By the time the fireworks display erupted later in the night during the Stones‘ “(I Can’t Get No) Satisfaction,” smiles were aplenty, and even as the traffic issues that plagued the event from earlier in the day continued, fans left the dusty venue buzzing about how Neil Young and Paul McCartney could possibly top and epic day one. Best Classic Bands will have those reviews.